New Delhi metallo-beta-lactamase with meropenem (red) in the active site. The discovery of penicillin and other antibiotics marked a milestone in the history of humankind, giving us control over the ever-present danger of infectious disease. Within a few short years after this discovery, however, the bacterial world began to fight back, and strains of bacteria emerged that are resistant to the antibiotics. In the decades that followed, and continuing to this day, medical researchers have worked to discover new antibiotics, both natural and designed, to fight these resistant bacteria. In recent years, we have been confronted by highly resistant bacteria that can destroy all of the drugs we have to throw at them. One of the most dangerous strains arose in south Asia and recently caused a series of deadly infections in Los Angeles area medical centers. These bacteria use the enzyme NDM-1 (New Delhi metallo-β-lactamase) to inactivate a wide range of penicillin-like antibiotics. The structure shown here (PDB entry 4eyl ) shows the enzyme after it has broken down a highly advanced carbapenem antibiotic. To make things even more dangerous, many drug resistance bacteria are able to share their drug-destroying enzymes with other individuals in the bacterial population. The instructions for building these enzymes is often carried on small circular pieces of double-stranded DNA called plasmids, which can be readily transferred from cell to cell. For instance, when a new bacterium takes up the plasmid that includes the gene for NDM-1, it gains resistance to a wide range of antibiotics. This grim reality is forcing medical researchers to look for new and different targets for antibiotic therapy, since these superbugs are not stopped by our best penicillin-like β-lactams. 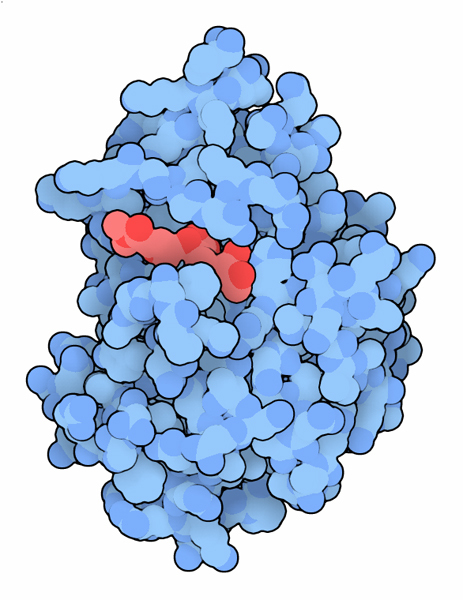 Carbapenemase KPC-2 with inhibitor (red). Antibiotic-resistant bacteria take many approaches to destroying these antibiotics. NDM-1 is a metallo-enzyme that uses two atoms of zinc to perform the reaction. A recent strain of Klebsiella pneumoniae, which also highly resistant to carbapenem antibiotics, takes an entirely different approach: it attacks the antibiotic with a particularly reactive serine amino acid. The research community is fighting back, though. 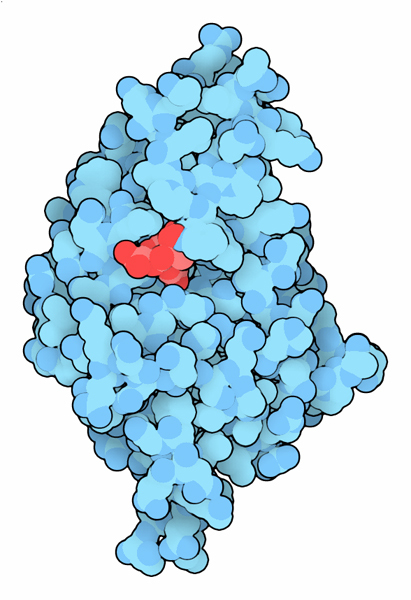 The structure shown here (PDB entry 3rxw ) includes a trial drug that binds to this serine and inactivates it. NDM-1 is particularly effective because it is not as specific as a typical enzyme. Most enzymes surround their substrates, so they recognize only their specific target molecules. NDM-1, on the other hand, recognizes the key reactive portion of the antibiotics using two zinc ions, but largely ignores the rest of the molecule. In that way, it can disable nearly all β-lactam antibiotics. 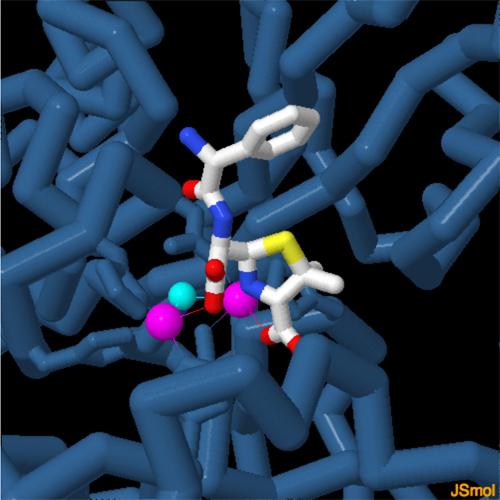 The picture shown here shows the enzyme bound to the antibiotic ampicillin (PDB entry 3q6x ), seen after the enzyme has cleaved the small molecule. To look at this enzyme bound to penicillin, cephalosporin, and carbapenem antibiotics, click on the image for an interactive JSmol. There are many stuctures related to β-lactam resistance in the PDB. You can explore some of these by using the Protein Feature View for TEM-1, KPC-2, or NDM-1. You can explore the structures of the antibiotics using the Ligand Summary page. For instance, take a look at the page for ampicillin. 4rl0: H. Feng, J. Ding, D. Zhu, C. Liu, X. Xu, Y. Zhang, S. Zang, D. C. Wang & W. Liu (2014) Structural and mechanistic insights into NDM-1 catalyzed hydrolysis of cephalosporins. Journal of the American Chemical Society 136, 14694-14697. 3rxw: W. Ke, C. R. Bethel, K. M. Papp-Wallace, S. R. Pagadala, M. Nottingham, D. Fernandez, J. D. Buynak, R. A. Bonomo & F. van den Akker (2012) Crystal structures of KPC-2 β-lactamase in complex with 3-nitrophenyl boronic acid and the penam sulfone PSR-3-226. Antimicrobial Agents and Chemotherapy 56, 2713-2718. 4eyf, 4eyl: D. T. King, L. J. Worrall, R. Gruninger & N. C. Strynadka (2012) New Delhi metallo-β-lactamase: structural insights into β-lactam recognition and inhibition. Journal of the American Chemical Society 134, 11362- 11365. 3se7: V. M. D'Costa, C. E. King, L. Kalan, M. Morar, W. W. Sung, C. Schwarz, D. Froese, G. Zazula, F. Calmels, R. Debruyne, G. B. Golding, H. N. Poinar & G. D. Wright (2011) Antibiotic resistance is ancient. Nature 477, 457-461. 3q6x: H. Zhang & Q. Hao (2011) Crystal structure of NDM-1 reveals a common β-lactam hydrolysis mechanism. FASEB Journal 25, 2574-2582. 1e4e: D. I. Roper, T. Huyton, A. Vagin & G. Dodson (2000) The molecular basis of vancomycin resistance in clinically relevant Enterococci: crystal structure of D-alanyl-D-lactate lyase (VanA). Proceedings of the National Academy of Science USA 97, 8921-8925.